Book review: Nnedi Okorafor's "Zahrah the Windseeker"
All I kept on thinking when reading this book was how I wish this was around when I was 13. I fell in love with fantasy/sci-fi novels, but especially fantasy novels when I was 13/14. That was the age when I was introduced to The Hobbit, His Dark Materials Trilogy, and read the first two Harry Potter novels in less than a week. So I know I would have been in literary heaven if I got this book at that age. Zahrah is a shy, introverted 13 year-old girl who lives in Ooni Kingdom on Planet Ginen, which is far far away from Earth. She has dadalocks (vines intertwind with her hair), is feared by others because of that and has been teased and treated as an outsider for as long as she can remember because she is different. Her best (and only) friend, 15 year-old Dari, is the only one that sees through that and sees her for her. He's also the opposite of Zahrah - adventurous, inquisitive and brave. Ooni Kingdom is pretty awesome - here technology and nature work as one. Zahrah has a floral laptop, which she grows. Despite Ooni Kingdom being very forward thinking in terms of technology, its people are very backwards and fear the unknown. "Dada" people like Zahrah freak them out, and they do not dare travel beyond the border of their kingdom, and definitely not into to the Forbidden Greeny Jungle. One evening Zahrah discovers just how different she really is from everyone else and the only person she can trust to not judge her with this new discovery is Dari. This discovery, coupled with Dari's curiousity, leads her and Dari to do things teenagers aren't supposed to do - visit the Dark Market and eventually the Forbidden Jungle to learn more about Zahrah's new discovery. It is on one of their secret trips to the Forbidden Greeny Jungle that Dari gets hurt and Zahrah is left with no choice but to go on a journey, which will force her to confront her fears all alone in order to save her friend's life. What a fascinating world Nnedi Okorafor created - Ooni Kingdom, the Dark Market, the Greeny Forbidden Jungle. While reading I could visualise all these places and all the weird and wonderful things Zahrah was seeing and I kept on thinking this would be amazing as an animated movie. The marrying of nature with technology was pretty cool - you grow computers out of seeds and flowers are currency. And the characters - the idionks, giant scorpions, war snakes, a fortune-telling talking speckled frog, the wise Greeny Gorilla people, bushcows. The little nod to Alice in Wonderland (Alice in Wonderearth) also made me smile. 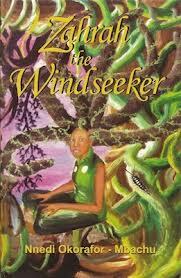 To be honest, overall Zahrah the Windseeker made me smile. It was nice to read a book set in a far, far away land that infused elements of Nigerian culture into it. And it was also nice to be nostalgic and remember why as a 13 year-old I fell in love with fantasy/sci-fi novels.